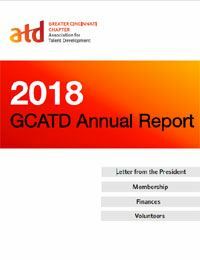 Each year GCATD lives out our chapter’s mission by providing value, creating awareness for growth and building our chapter through the many activities led by our engaged volunteers. As a professional organization, we know that we are only as good as the value we provide to our members, and the delivery on our mission. In connection to this value and our mission, we are proud to share that in 2018 we offered 38 Learning and Networking Events. Learning events were attended by an amazing 685 professionals!